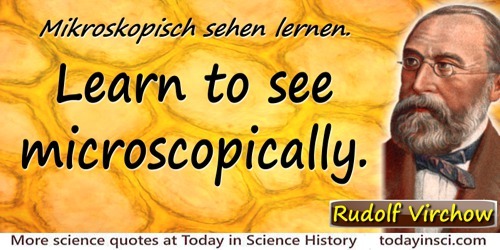 German pathologist and statesman who originated the concept that disease arises in the individual cells of a tissue and, with publication of his Cellular Pathology (1858), founded the science of cellular pathology. In 'Festnummer zu Ehren Rudolf Virchow', Deutsche Medicinische Wochenschrift (1891), 42, 1166. 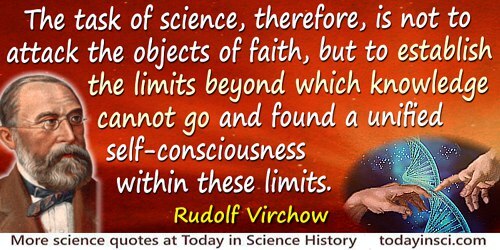 As quoted in Erwin H. Ackerknecht, Rudolf Virchow: Doctor Statesman Anthropologist (1953), 21. 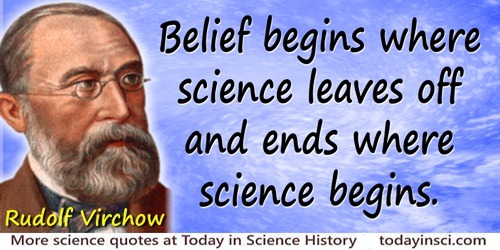 Belief has no place as far as science reaches, and may be first permitted to take root where science stops. 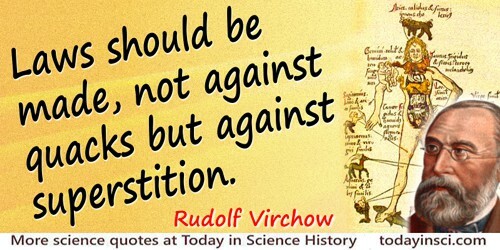 On the occasion of the centenary of the Veterinary College in Berlin (1856). Translation of original German, “Zwischen Tier und Menschenmedizin gibt es keine Trennlinie, noch sollte eine bestehen.” English translation quoted (without citation), as opening remark in J.V. Klauder, 'Interrelations of human and veterinary medicine', New England Journal of Medicine (23 Jan 1958), 258, No. 4, 170. Disease is not something personal and special, but only a manifestation of life under modified conditions, operating according to the same laws as apply to the living body at all times, from the first moment until death. 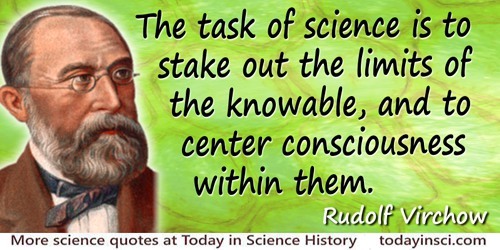 In Ian F. McNeely, Medicine on a Grand Scale: Rudolf Virchow, Liberalism, and the Public Health (2002), 26. It is the curse of humanity that it learns to tolerate even the most horrible situations by habituation. 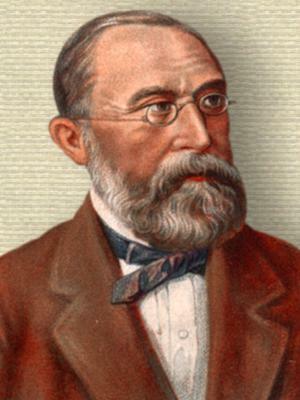 From the original German, “Es ist ein Fluch des Menschengeschlechtes, dass es durch Gewöhnung auch das Schrecklichste ertragen lernt,” in 'Mittheilungen über die in Oberschlesien herrschende Typhus-Epidemie', R. Virchow and B. Reinhardt, Archiv für pathologische Anatomie und Physiologie und für klinische Medicin (1848), 2, No. 2, 156. 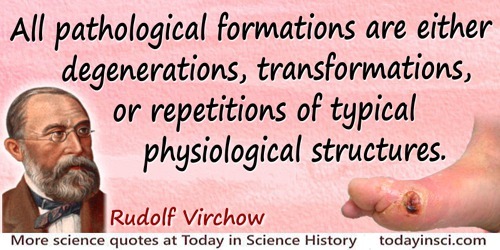 As translated in Rudolf Virchow and L.J. Rather (ed. ), 'Report on the Typhus Epidemic in Upper Silesia', Collected Essays in Public Health and Epidemiology, (1985), 213, as reprinted in Social Medicine (2006), 1, No. 1, 16. 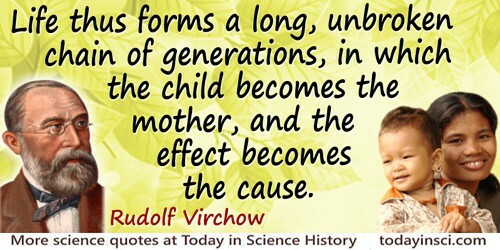 Marriages are not normally made to avoid having children. Bulletin of the New York Academy of Medicine (1928), 4, 995. 'Standpoints in Scientific Medicine', Disease, Life, and Man: Selected Essays (1958), 39. As found in Bernard E. Farber, A Teacher’s Treasury of Quotations (1985), 264. This is probably a loose translation of the original German: “Die Aufgabe der Wissenschaftquote”..., See the more literal translation on this page, also beginning “The task of science…,” for full citation. Webmaster has not yet found a primary source for the shorter translation in these words—can you help? 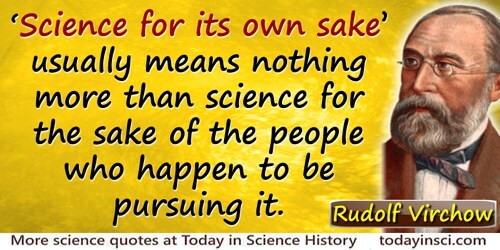 “Science for its own sake” usually means nothing more than science for the sake of the people who happen to be pursuing it. 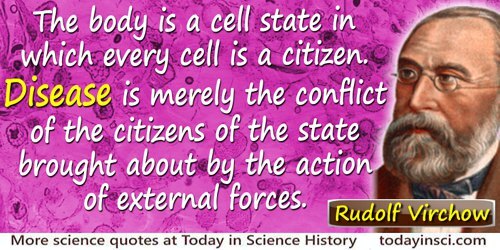 In 'Standpoints in Scientific Medicine', Disease, Life, and Man: Selected Essays (1958), 42. 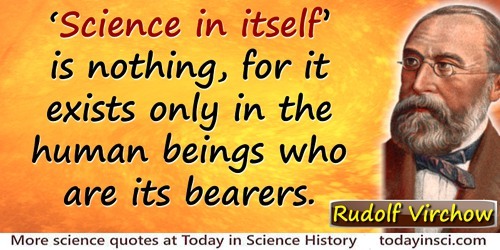 “Science in itself” is nothing, for it exists only in the human beings who are its bearers. 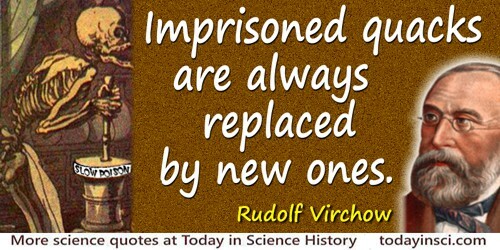 13 Oct - short biography, births, deaths and events on date of Virchow's birth. 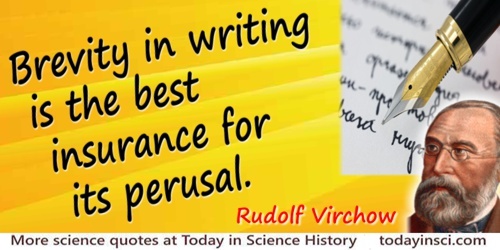 Collected Essays on Public Health & Epidemiology, by Rudolf Virchow. - book suggestion.